Communication between Doctor and Patient: Is it Important? Here I just share a story about my own experience. About a month ago, I had a uteri myoma surgery (benign tumor in the uterus) at one hospital in Jakarta, Indonesia. 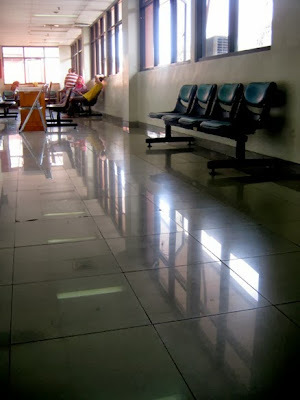 Although my residence is in Bogor city, I chose to have surgery there because my main reason was, I already trusted a doctor –let’s say doctor A here- who practices in the hospital and don’t want to switch to another doctor. I’ve ever tried consulting to a few doctors in Bogor (the city where I live) before, but unfortunately I haven’t met one who can make me comfortable enough to discuss about my health condition. I’m a sensitive type of patient, if there are words -from a doctor- that make ​​me more 'down' or tend to blame, I definitely don’t want to see her/him again. In my opinion, the way of communicating of a doctor to patient is very important. Doctors who able to answer any question, make every patient comfortable, explain the condition of the disease and use positive words are a kind of doctor that we’re looking for, right? I wanted to visit doctor A because he is a doctor of all sister-in-laws and they recommended him to me. At our first consultation, he never blamed my fear to surgery and considered it as a humane thing. Doctors who like to ‘blame’ will say things like, " Why don’t you come earlier; the cure is definitely easier if you consult since the beginning; why it’s left too long, blah blah blah ... " He – doctor A - instead asked us to joke with funny stories about fear feeling. I was afraid of surgery, but I think I’m not the only one. Actually, my main reason for delaying surgery was because of my intention to keep the womb as long as possible as we haven’t been blessed with child. But it turned out none of our alternative efforts was successful, my condition continued to decline with a variety of health problems; I felt I couldn’t wait anymore and must be ready to accept surgery option as the best solution. Doctor A described my condition with easy-to-understand language, gave encouraging word and hope but still asked me to think realistically. He was also a humble man, "Maybe there are other ways that can heal you, but I did not learn it. Since you come to me, I can only offer an operation option. I will do my best to maintain the uterus as long as its condition still can be maintained. But we can’t keep the uterus that not functioning anymore, right? " At that time, I already surrendered my life to God and entrusted the operation to the doctor A. My husband who always supports gave me more strength that I needed.